The stepper motor shield is a carrier for up to four Pololu stepper motor drivers. It plugs into the Arduino and has points where to attach stepper motors. The shield kit also includes three drivers, each with a small heatsink to attach on the driver chip. Another option is the GrblShield, which at the time I ordered my parts appeared to be unavailable. However, I just checked and I think it is for sale again. Mostly for expediency, I decided to buy from Reactive Substance, although the web site had a bit of a fly-by-night feel. Fortunately I did receive the shield and all the electronic parts in a timely manner and was not disappointed. Additionally, Reactive Substance provides some very detailed YouTube videos on how to assemble and solder the shield. I used this to successfully finish the shield. Take your time assembling – I found it useful to watch each video twice to make sure I get each assembly detail correct (I’ve made the mistake of attaching parts on the wrong side of a board before) Keep a laptop with the videos playing next to your solder workbench – and don’t rush. They suggest installing the screw terminals as optional, however I strongly recommend they be installed. I had to undo and redo the wiring on more than one occasion, and soldering the wires directly would have been a disaster. Another thing to note – you must use the headers provided; otherwise your shield will be touching the Arduino and would short itself out. The headers provide greater separation between the two components. The final step calls for installing the provided Pololu drivers and then attaching the heatsinks on each driver. It is worth noting that due to overheating, I later removed the individual heatsinks and replaced them with a modified CPU heatsink. The overheating was not a fault of the drivers, I will explain in the next section. Overall very pleased with Reactive Substance and the final results. 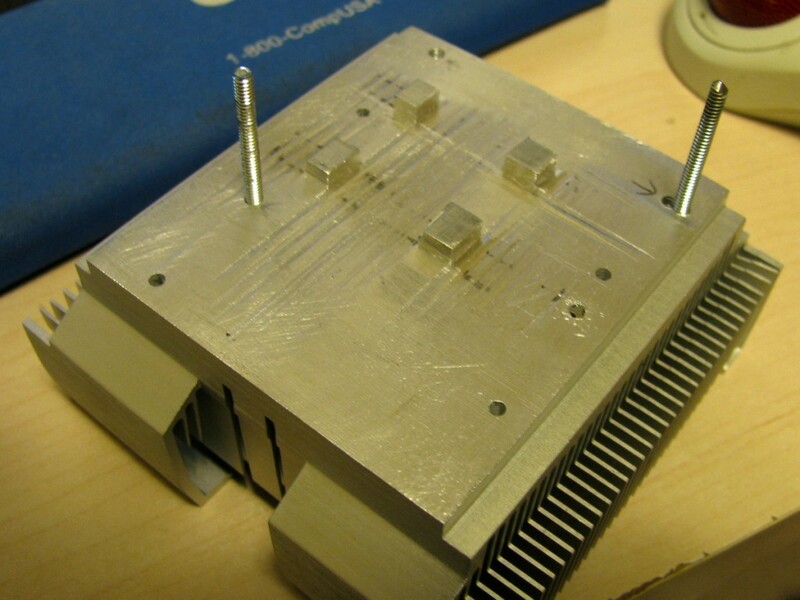 Important note about the monolithic heatsink approach: If you decide to do this, you must use heatsink compound on just the nubs and do not overtighten the shield to the heatsink – the best is to tighten just so it barely touches – let the compound do the heat transfer work for you. I overtightened the first time and I broke a trace on one of the driver carriers, ruining it. (My) process of accurately modifying a CPU heatsink is complicated due to offset positions of the driver chips, placement of shield holes, and use of headless screws. Due to the unconventional method used to mill the heatsink, and its attendant safety concerns, I will not disclose how I milled it, sorry. The shield uses plug-in Pololu stepper motor drivers. Continue on to learn more. Custom CPU heatsink modification for stepper motor shield. Regarding the holes – measure once, cut twice.